Castration [emasculation], stated simply, is the unsexing of a male animal. The practice of castrating males, in animal species used for food production purposes, is universally practiced and is probably one of the oldest surgical operations known to man. Small Animal Surgery Kit is used for Small Animals Surgery like Dogs, Cats, Pigs, and many other small animals. Surgery kit contains all necessary tools to perform complete surgery. All Tools are made from Surgical Grade stainless steel and used by professionals. Medical Tools 24 Instruments is compiled for Small Animal Surgery Kit. Medical Tools has introduced Feline Spay Pack. 19 Instruments Feline Spay Pack contain all instruments used for spay surgery. All instruments surgical grade used by professionals. This tool has three actions: clamping, crushing and cutting. It draws the cord concentrically into the jaws, thus preventing slipping of the cord, as the jaws are closed on the spermatic cord it is gripped by the clamping part. Ratchets holds emasculator locked. Tooth extraction is a common dental procedure performed in most veterinary practices. Medical Tools 18 Instruments dental extraction kit has all appropriate instruments to perform selective or full mouth dental extraction. All Tools are made from Surgical Grade stainless steel and used by professionals We also make custom design surgery kit to meet with specific needs, All tools are packed in Free Sterilization Cassette. 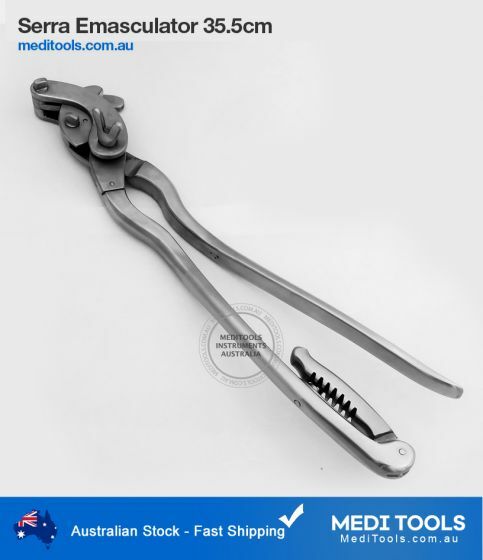 Polansky Vaginal Speculum is designed for large animals, It is used for diagnostic examinations and other procedures. It holds the labia open so the vaginal vault can be viewed for swabs taking or direct medication to the uterus. it can also be used during the urinary catherterization of a female. Medical Tools Polanksy Speculum is made of surgical stainless steel it can be processed for frequent sterilizations and long life. with its butterfly screw its simple to operate, simply turn the hand screw until the desired opening is achieved. Entomology is the scientific study of insects, a branch of arthropodology. At some 1.3 million described species, insects account for more than two-thirds of all known organisms. Like several of the other fields, entomology is a taxon-based category; any form of scientific study in which there is a focus on insect-related inquiries is, by definition, entomology. Entomology, therefore, includes a cross-section of topics as diverse as molecular genetics, behavior, biomechanics, biochemistry, systematics, physiology, developmental biology, ecology, morphology, paleontology, anthropology, robotics, agriculture, nutrition, forensic science and more. Veterinary surgery is performed on animals by veterinarians. Most common surgical procedures in animals is neutering and minor mass excisions. In older dogs and cats tumors are a common occurrence. Medical Tools 23 Instruments Surgery Pack is compiled for general surgery. The pack contains all instruments used for surgery. All instruments surgical grade used by professionals for surgery. 11 Instruments Advance Eye Pack is compiled for professional eye surgery. Medical Tools’s Advance Eye Kit provides a full range of instruments for veterinary ophthalmic diagnostics, therapeutics and surgery. Ophthalmologists use these instruments in diseases of the eye affecting small animals, large animals, zoological and wildlife species. All instruments surgical grade used by professionals.